Ricardus Dawkins acroasim mense Iunio 2006 habet. 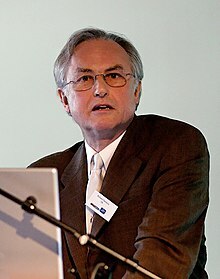 Ricardus Dawkins (Anglice Richard Dawkins; natus Nairobiae in Kenia, die 26 Martii 1941) est Anglicus studiosus ethnologiae, evolutionis biologicae, populationisque? scientiae, cui est cathedra Caroli Simonyi in Universitate Oxoniensi. Advocatus atheus late notus est qui, super operibus de biologia evolutionaria suis, et libros de reprehensione religionum ac praecipue Creationismi scripsit e quibus maxime celebrati sunt Delusio de Deo (Anglice The God Delusion) et Spectaculum Maximum Terrae (The Greatest Show on Earth). Etiam atheista qui fidem esse delusionem putat, humanista, scepticista ad libertatem cogitationis, notionem memorum excogitavit, ac cosmotheoriam optimismi (Anglice Bright) tenet. At discriminationem contra atheismum pugnat. Vicimedia Communia plura habent quae ad Ricardum Dawkins spectant. Novissima mutatio die 28 Decembris 2018 hora 21:36 facta.